I can’t seem to keep from starting new projects constantly. Once I had use of my hand again I just wanted to start all the things right now. The upshot of this is that I keep seeing awesome stitchalong projects and wanting to do them. This is not getting my quilt finished any quicker — and winter is here. There’s been snow on the ground all day, not much but it’s mid-afternoon and hasn’t melted yet. The quilt will have to wait just a bit longer, though. 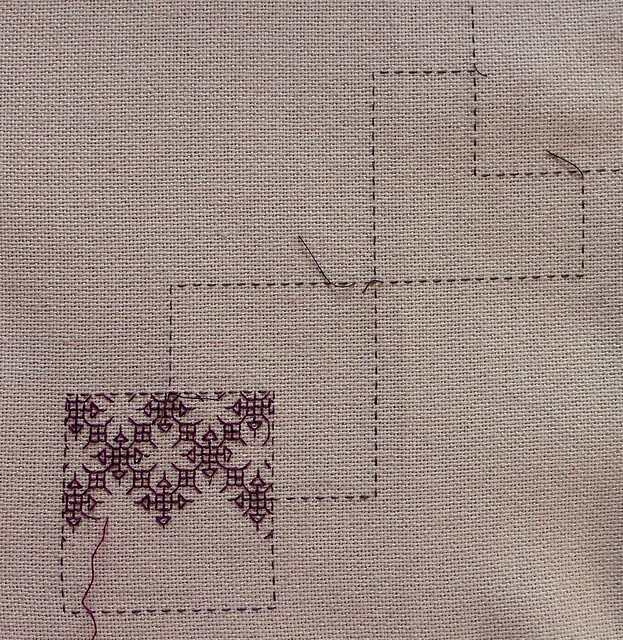 &Stitches is doing an un-blackwork stitchalong for November, with a few different templates available. 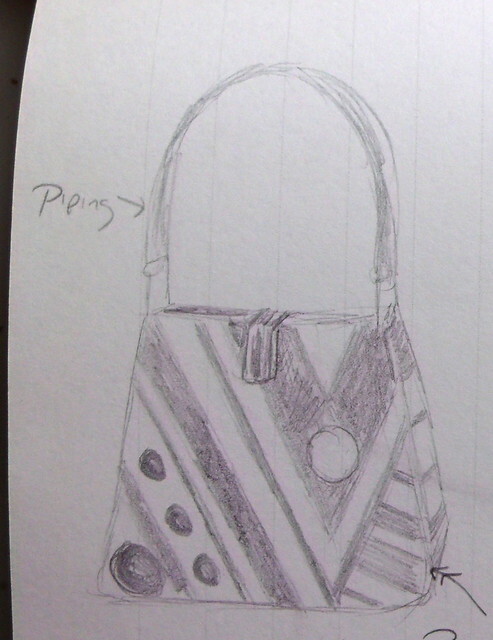 There’s one with overlapping squares, and something about overlapping blocks has been tripping my trigger lately. I ended up setting up my project right then and there, around midnight when I should have already been in bed. I had a bit of a false start — my first attempt was in red on this white viscose Aida that I had hanging around. It’s lovely and soft to the touch, but it was frustratingly splitty. The tapestry needle kept splitting the cloth in the wrong places, and it was driving me crazy. I’m also in the middle of another all-red project right now, so when I decided to try again on some light brown cotton evenweave I switched colors, too. I haven’t gotten all that far with it, but I’m very happy with it so far. I ended up repeating the template four times (though I’ve only marked out the first one in basting thread so far on this one) because I thought it would look really neat. Probably thus guaranteeing that I won’t finish in November! But I have five days off work over Thanksgiving and no big travel plans or anything, so I should have plenty of time to work on it. 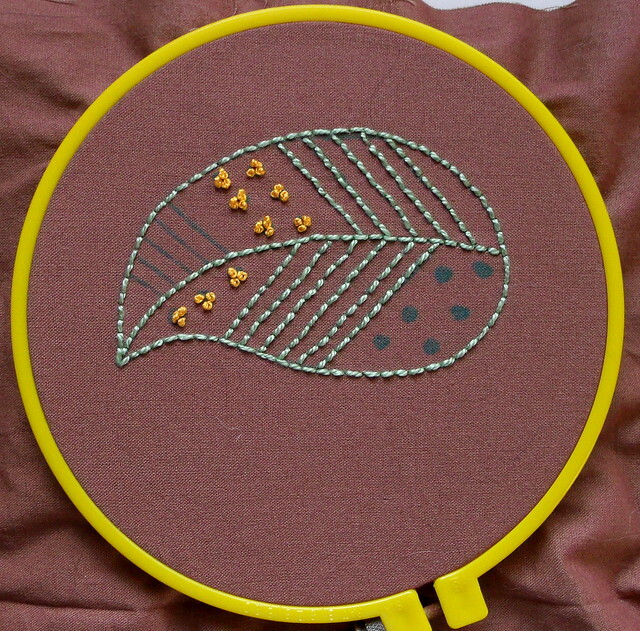 And then yesterday I read Carina’s blog post announcing a Stitched Blooms stitchalong. There are prizes and everything, and you should totally go check it out. There’s a downloadable sheet with some of the motifs from the book for anyone who doesn’t have a copy of the book. Which might explain why this motif was so appealing to me, though I’ve somewhat undermined the lines-and-circles thing by making clusters of French knots for the circles. I’m considering taking those out and doing little satin stitch circles instead. It’s working up pretty quickly since I’m using perle cotton. I feel as though my backstitch is a little sloppy. It always seems to be in perle cotton, not sure if is just that I mostly use perle cotton for running stitch and French knots and don’t get much practice using it for backstitch. Or maybe just because it’s heavier, and thinner floss hides uneven bits better. I also finally got around to cutting and braiding my perle cotton. I wish I’d done this ages ago! Most of my partially used skeins were really tangled. 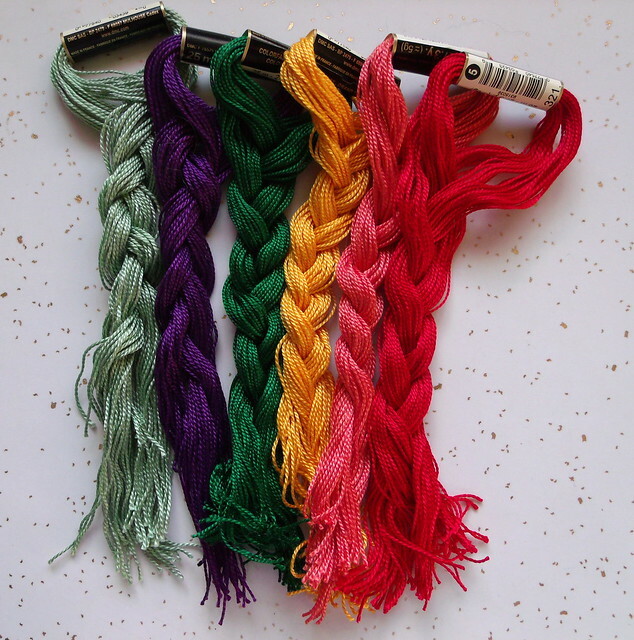 This is so much easier to use, and the little braids look really cheerful.